Saudi women make up about 49 percent of the total population. They live in patriarchal and male-centred societies. Traditionally, women have held an inferior position in Saudi society, restricted to the home and marital duties. Education and access to employment opportunities for women have helped some women to secure their financial independence, while gaining a higher status in their communities. 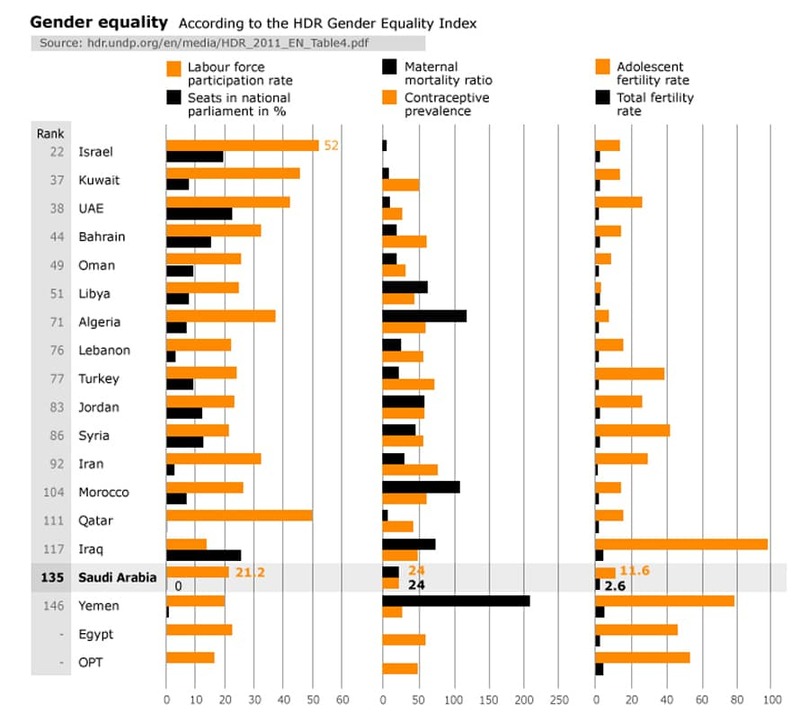 Saudi women scored very low in the Global Gender Gap Report of 2012. The report measures gender gap based on four indices: public and economic participation of women, education, health and mortality rates, and political empowerment. The Saudi score was 0.5731, ranking Saudi Arabia as 131 among 135 countries, with only Yemen lower in the region. Among the Gulf Cooperation Countries (GCC), Saudi Arabia has been slow to address the progress of women’s status. The 2010 Freedom House report lists Saudi Arabia as the country with the lowest score in combating discrimination against women in five areas: access to justice, independence, security and individual liberty, equal opportunities, political and civil laws, and social and cultural rights. Saudi Arabia had a total score of 1.4 of 5, the lowest of all GCC countries. Women who are arrested for socializing with a man who is not a relative may be charged with prostitution. Saudi Arabia imposes a guardian system on all women, regardless of age, whereby every woman needs the permission of her male guardian to access governmental services, enrol in education and certain jobs, marry, divorce, file a law suit or court case, or travel abroad. In addition, the rate of political representation of women is only 7 percent, and few women are appointed to top positions in the government or the Majlis al-Shura (consultative council). Women in Saudi Arabia represent less than 18 percent of the total work force and face a stagnant unemployment rate of around 30 percent. This high rate does not tally with the percentage of women graduates in higher education. The problem is the strict gender-segregation policies that are promoted by the religious sects and prevent women from joining the work force. Most women work in education and health care. The government, faced with the high unemployment rate, recently has created more opportunities for women in retail sales of lingerie and cosmetics shops whose services are marketed towards females, although this was fiercely resisted by the religious community. Saudi Arabia is the only country where women are not allowed to drive; this makes public engagement and economic participation difficult. Women are prohibited from sport and several other public activities under pretexts based on religion or custom. The government has initiated an ambitious plan to accommodate more women in the government by allowing female participation in the next municipal elections and in advisory-council appointments, increasing the number of women sent abroad on scholarships, and offering new majors for women in engineering and law in higher education. Informal groups of women are actively organizing campaigns and other efforts to reduce the restrictions on Saudi women and allow them better access to services and opportunities.